I need some walkway ideas for my front yard. I have a brick house and am not sure what to do. 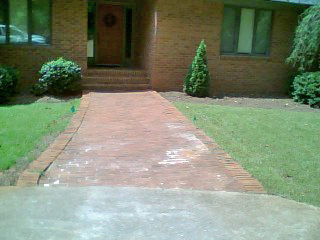 I am forwarding pictures of my brick walkway I took with my cell phone as a follow-up to an email I sent you. I really want to update the front of my home and would like ideas for a walkway, etc. I hope you can tell a little about my home from these photos. It is an orange or warm brick with beige mortar. The steps and walkway are the same brick as the house. I think it needs more interest. Any ideas? Also, from your experience, what category for "style" house would you say mine is? I appreciate your time and advice. Thanks so much. I would make your walkway wider just before the steps. Extend it out by approximately 18" on wither side and make it 4' deep (about). Then I would get some really pretty large urns and place them in the extended area against the house. In this way, your walkway will have a shape and you will provide some interesting focal points as you approach the house. For materials, perhaps some gray and rust colored pavers in about 3 to 4 different sizes. Place a soldier course (border like you now have) in perhaps the gray color for contrast, or leave it the same as the field. You can re-do the steps or leave them as they are. I think those ideas would spruce things up. We have built a new house and are starting from scratch with landscaping, walkways, drives, etc. The house is built on what was once part of my grandparents farm and I want our house to look like it has been a part of it for a long time, not a new house plopped in the middle of a field. My dilemma at this point is what material to use for our front walkway. Our drive is rather long and winds up to the house around a pond in a flattened "s" shape. I am thinking about putting a "parking area" in the second bend of the driveway which would connect with the front porch via the walk. The walk would be long enough to have some curve to it. The front steps that it will lead to are 6 foot wide brick steps. I have thought about using some type of gravel/rock material for both the parking area and the walk. I like the idea of the old-fashioned "crunching" sound heard when driving or walking on this type of area. I am not opposed to some type of pavers for the walkway, however. Just not sure what to use. We live in Kentucky so we do get freezing and thawing during the winter. Any suggestions would be greatly appreciated!! Your walkway material idea as to using a type of loose stone would work. You could use and inexpensive crushed stone or something more decorative...a small pea gravel or similar. If you have a stone yard nearby, you could see what they offer. If you do go this route, I would suggest lining the walkway/driveway with a steel edging. This will prevent the stone from flowing into the lawn or planted areas. After saying all of that, crushed stone is rather naturalistic looking walkway material, and I am not sure if that is true to what have been used on a farm. (It's fine for the parking area). They probably would have used more of a local stone for walkway materials. You mentioned the porch will be brick, but did not say what material the house will be...siding? If you could match the brick to the porch brick, I am sure that would look great. A natural stone or brick would look better and more authentic than pavers. Pavers are a man-made material from concrete, and although some of them are quite nice, if you are looking for a true older look, they won't provide that feel as well as the natural materials will.Brick is made from clay. If there is any stone on your home, bluestone might work. But I think my first choice would be brick, if it is affordable. You can have it dry laid which looks great and is less expensive than brick set concrete. Also, it will resist and freeze-thaw conditions, and if anything were to occur, they can be easily re-adjusted. We are deciding what to do about our front walkway and backyard patio. My husband and I are undecided about what to do with these areas. We live on a tropical island, and get a lot of sun. We wanted to put either bricks or concrete in the front, and maybe concrete in the back. We have two children under 6 and no pets yet. We like to have family functions. Our yard tends to flood when the rain comes, so this is another issue in choosing the right material. Our house is situated somewhat on a bend. My husband wants a wall also. We have intentions for a bit of grass too. What would be the right way to go? Let's talk about paving materials. It appears that you want something that might be cool on the feet, although I don't know if that's a priority. Also, it would be a good ideas to use something that does well in flooding conditions. Probably concrete is a good idea. I say this because if you have a lot of flooding, water will seep into the joints of any paver-type material, such as brick. This is not necessarily a bad thing, but over time I would imagine it would be detrimental to the sand in the joints. Make sure it is installed correctly, particularly due to the fact that it will be sitting in a lot of water. Any water that seeps down and under should easily percolate down through the stone base beneath the paving and not sit there. This is a question about replacing a walkway and steps in regard to materials. Currently we have a long winding stairway from our driveway to our front deck which is made of old railroad ties and aggregate. The ties are rotting (originally installed in 1986)and we need to replace the whole stairway. We are just getting quotes now and really wanted to use natural stone but fear it may be too cost prohibitive. Do you know much about Cultured Stone and would you recommend looking into it for this purpose? Are your referring to the flat "stones" that are manufactured to resemble flagstone or bluestone? I have seen these although never used them. The ones I saw were at a botanical garden. They were made up of irregular small pieces. I'm a true fan of natural stone and that would be my first choice. However, I understand that budgets are a reality. I know those railroad tie steps of the 1980's and I understand your wanting to replace them, both for aesthetics and also for the deterioration. Being that the area is on a slope, it's important that the design be both attractive and functional. Once you have this and attractive plantings, the hardscape material itself will be less important. There are many choices. Take a look at my page Walkway Designs and the links to different types of paving. Also see my page on Landscape Steps. These will give you lots of information and ideas. Here's a questions about a concrete walkway and incorporating bluestone. How about adding edgings? If it wouldn't be too difficult for you, you might consider saw cutting out some of the areas of the concrete walkway and adding a few pieces of bluestone. In other words, you could take a piece of bluestone (a nice pretty shaped, fairly large one) and add it to the edge extending into the walk itself about a few inches or more. Do this in a few strategic places. You could also add a bluestone border, but just in a few areas and fill in the open areas between the bluestone borders with plants. Is is possible to use pavers as a border along a curving exposed aggregate walkway? How are the curves handled in setting the pavers? Take a look at this picture. It doesn't show a lot of the curve, but you can get somewhat of an idea of what it looks like. Basically, the pavers are laid following the curve. If it's a very tight curve, you might want to use pavers that are not the full 8" length since the joints will get wider as they go further out from the main walk. Concrete pavers come in a few smaller sizes. You can actually get a few pavers and lay this out to see what it would look like. This is a question about walkway ideas and what paving materials to use. Hi, I hope you can help me. I have a small ranch style brick house. The house was built in the 50s and the brick was an ugly orangish color. I painted the brick in a very light cream color(almost white) I have a cement driveway in the front of the house. My question, is -- I want to put in a curved walkway from the driveway to the cement stoop at the front of the house. As you can see, so far I am dealing with an all practically white front. What should the walkway be made of? A small brick pattern, interlocking pavers, flagstone or what? Any suggestions would be greatly appreciated. The walkway will be a about 16 ft. How wide should it be? What color? Help!!!!!!!!!!! Wow, you really have an open slate! Bluestone looks lovely with any type of brick. Brick shapes might fight the brick design on your house. With pavers you could use really any color. I think my first choice would be the bluestone. The top to photos are know as "patterned" bluestone. The joints in the walkway would be 1/4" to 1/2' wide and filled with sand or polymeric sand (which hardens). Make the walkway four feet wide. This will allow two people to walk side by side. You are not going to forget about plants, are you? :) They will provide lots of color and textures, especially if you use perennials. Getting back to walkway ideas, the bluestone will come in different colors.You can use all blue or full range. The photos show full range, while all blue is all the same color - blue.